My special guest this week is YOU! 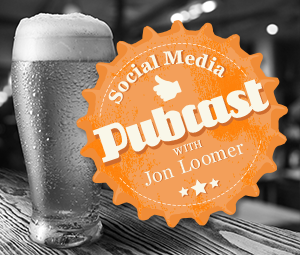 Welcome to the virtual pub, where you and I get drunk on social media. For the first time in a while, I didn’t have a guest this week. But it actually gave me the opportunity to catch you up on some things and give you a look inside what goes on behind the scenes. The nice thing about recording by myself this week is that it gave me an opportunity to give you some insight into some of the things I’m dealing with. I don’t have it all figured out, and I go through many of the struggles you do. My life has been incredibly busy lately, and a big reason for that is baseball. I’m a huge baseball fan, and my three boys are all now playing. I coached my two oldest boys this year, and it was definitely the most fulfilling season I’ve had. This busy baseball season came at the expense of business. I simply didn’t have time to take on another client, start an online program or redesign my site. You pick and choose what is worthwhile, right? That said, I am working on the redesign of my site. I’ll continue to use Genesis Framework, but I am moving to a mobile responsive theme (more on that soon!). I’m also working on a new online training program. I’ve been working on and delaying this for months, but I’m hoping to finally go public soon. I’ll be opening for pre-pays shortly, giving early arrivals a big discount. Stay tuned! If you haven’t noticed, I’m making my One-on-One Coaching Sessions a higher priority for my business. This has been a hugely successful program, both for my clients and for my business. Simply go to JonLoomer.com to reserve a session. You’ll have 45 minutes to get one-on-one time with me to talk about whatever your issues are with Facebook or content marketing. Just for listening to today’s show, you get a discount. Listen for the promo code! ShortStack: What I’ve used for a year and a half to build all of my Facebook tabs. Love this tool! PerfectAudience: One of the tools I use to create FBX — Facebook retargeted ads. This is the future of Facebook marketing. Use this link to get a free $70 trial — this covers the ads themselves, too!